If you are wondering around the pop up stages on the Sunday of the Country 2 Country Festival at the O2 Arena, an essential look in should be Alice Wallace. The name may be new to many folks in the UK, but the sound will be familiar to those constantly seeking out the soul of country music. 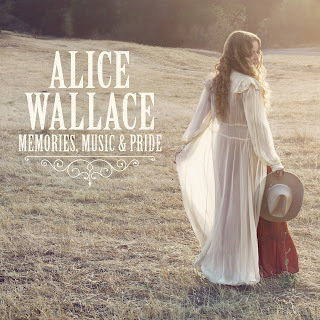 MEMORIES, MUSIC AND PRIDE is the third album release by the Southern California-based Alice and had its US debut at the back end of last year. Upon a solitary listen, this eleven track collection immediately grabbed the attention and invited many repeat plays. This was absolutely inevitable considering the music has the agenda of honesty, integrity and true to the desires of the soul. It is a record sharing the vision of travel broadening the mind and pinpoints an artist with impeccable taste. California country music has often ploughed down its own path, dating back to the Bakersfield Sound and the 60s/70s pioneering infusion of rock and folk. Alice is not shy on factoring in external style influences into her music and walks the fine line of being progressive without bowing to popular trend. Like a good ole solid country song, Alice’s compositions explore a wide range of personal emotions wrapped in an explicit coating of stark authenticity. A voice soaked in the dulcet tones of everyday Americana breathes life into each story and an ear pleasing soundtrack is on hand to add much more than the gloss of the tunes. The album’s title sums up Alice’s mood from spending so much time taking her music on the road. It appears as a line in ‘Luck, Texas’, just one of those quirky small town names as well as hosting a honky tonk where Alice played whilst on tour. This track is equally as memorable for its midway tempo switch and is just one of many notable highlights of the band playing an important part. ‘Poor Cleopatra’ sits one track earlier on the running order and displays Alice’s skill of weaving a story into an observation picked up from travelling. This piece also contains some classy pedal steel which sets the sound tone for a majority of the record. Jeremy Long is the said musician and also excels on organ, keys, accordion and dobro. Instrumentally the album kicks off with a varied sound as Alice’s vocals roar in gear on the ballsy and sassy ‘I Just Don’t Care Anymore’. From this start we know she ‘ain’t taking no crap’ and the rest of the album portrays Alice as a performer in total control, while flourishing incessantly on all the attributes that make this a top record. Two other singers-songwriters came to mind when listening to Alice for the first time. Allison Moorer was heard on the emotive ‘Perfectly Painful Life’, complete with a soulful backing sound, while immediately the vocal sound drew comparisons with UK artist Danni Nicholls. Alice herself throws more names into the mix when referring to influences in her online bio. These unsurprisingly include modern day country influenced artists finding refuge under the Americana banner and iconic traditionalists who will always retain the true spirit of country music. By tribute, Alice covers the 30s Patsy Montana standard ‘I Want to be a Cowboy's Sweetheart’ and her version sits comfortably with the many others, complete with yodelling. We are now at the centre point of the album and the second half continues to arouse your interest with great song writing alongside the stylish musical offering. ‘A Traveling Song’ is the album’s pivotal track with its biographical stance incorporating truth, positivity and plain speaking inspiration. It emerges as the complete ballad, bottling up the true essence of making your living in this unconventional way. Alice’s song writing peaks in this song with the immortal line ‘The only true thing we have in this life is a chance to wake up in the new morning light’. Of course this life can have its downside and the pain, bitterness, imperfection and lost love is fertile ground for songwriters. ‘Rough Around the Edges’ moves into this territory and ‘Ohio Boy’ gets deep down into the psyche of the travelling singer-songwriter. 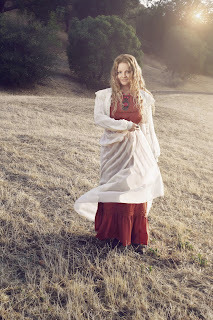 We have mentioned the potpourri of genre input energising this album and ‘Grateful’ see Alice firing in full folk mode. ‘Leave’ is the album’s sole original co-write and represents the smooth side to a record which will have little difficulty in appealing to a wide range of listeners prepared to chance their arm on an artist they aren’t familiar with. ‘If I Didn’t Win’ concludes the track listing and the clear winners are Alice Wallace for making such a great record and the adventurous music seekers who find her. MEMORIES, MUSIC AND PRIDE is an album for the tuned in and turned on. It’s packed with enlightenment and inhibitions are certainly down. The memories are vivid, the music is pinpointed and the pride is immense. 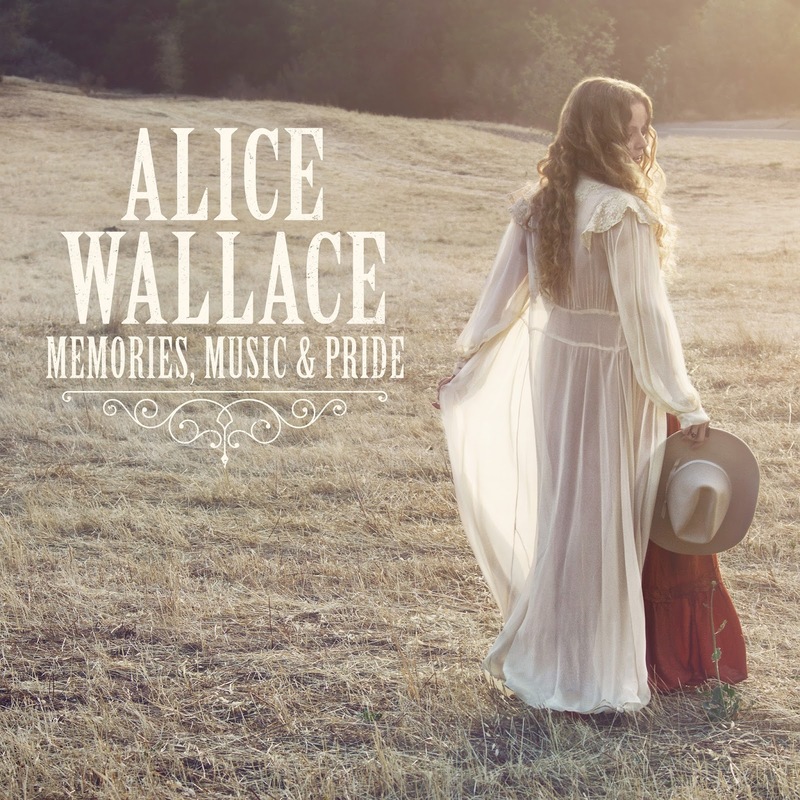 Alice Wallace is an artist worthy of your consideration and the architect of an album poised for widespread appeal. Her inaugural UK trip in March should be the start of something big if the gods of justice are looking on.